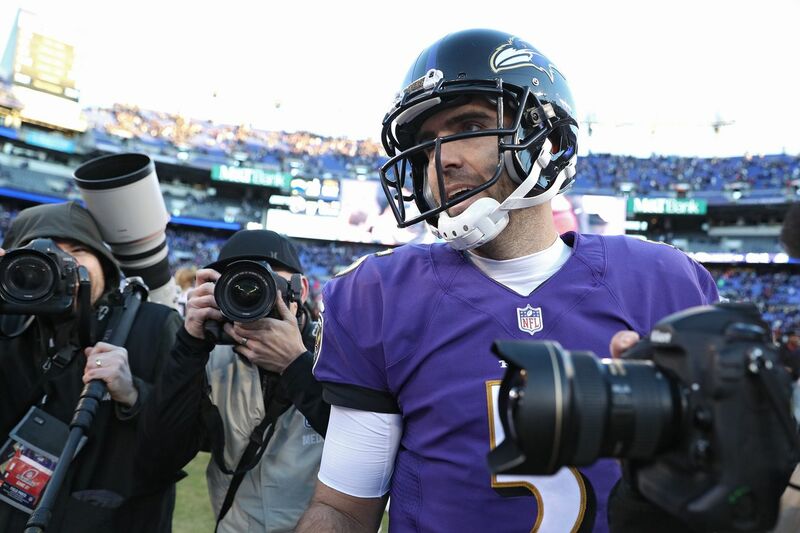 The former Super Bowl MVP’s time in Baltimore is over. Joe Flacco was the greatest quarterback in Baltimore Ravens franchise history. And now he’s headed to the Denver Broncos, according to ESPN’s Adam Schefter. Or at least he will be once the new league year begins on March 13 and teams are allowed to trade players. The Ravens traded their former Super Bowl MVP for a fourth-round pick, according to Albert Breer. Baltimore is officially turning the reins of the offense over to Lamar Jackson for good in the process. Jackson, the 32nd pick of the 2018 NFL Draft, proved his run-heavy collegiate game could translate to the pros last fall; he went 6-2 as a starter, leading Baltimore to the AFC North title in the process. That left little room for Flacco, the hero of the Ravens’ 2012 championship run. The pride of the University of Delaware made himself the league’s top-paid player months after his Super Bowl XLVII victory, but ultimately failed to live up to that massive contract. He never became the elite quarterback Baltimore hoped he’d become, topping out at “good” before backsliding to close out his career with the club. The Ravens went 72-40 in Flacco’s first seven seasons in Baltimore. He finished his run with the franchise with a 24-27 record as a starter in his final four seasons. Jackson was a revelation as a rookie, baffling opposing defenses with his ability to extend plays and charge downfield with little warning. Baltimore proved a welcoming environment for the former Heisman Trophy winner, giving him the flexibility to get creative in the pocket and become the league’s most punishing mobile quarterback. The rookie averaged 17 carries and nearly 80 rushing yards per game as a starter while leading the Ravens from the brink of irrelevance and into the postseason, recording double-digit wins over the Chargers and Falcons in the process. While that hot start cooled in a postseason loss to Los Angeles, Jackson’s high ceiling, low cost, and streaky rookie campaign marked him as a potential franchise quarterback in Maryland. He’ll have to progress as a passer to reach his full potential in the NFL. Questions about his ability to make throws downfield persisted as a rookie, where he completed only 58 percent of his passes and threw for only six regular season touchdowns. He wasn’t helped by a low wattage receiving attack, and if the experience of quarterbacks like Jared Goff and Mitchell Trubisky are any indication, an upgraded cast of targets could lead to a significant jump in year two. Does Flacco still have anything left in the tank for the Broncos? Looking over the veteran’s final two seasons raises an interesting question: did Flacco regress significantly after he turned 31, or was he hung out to dry by a roster with few legitimate targets? Baltimore’s top target in 2018 was a 31-year-old Michael Crabtree, who caught just 54 percent of his targets. Before that, Flacco’s 2017 receiving corps was led by Mike Wallace, Jeremy Maclin, and Chris Moore. That led to some low-impact performances, but it’s not as though he’s been a lights-out quarterback through the rest of his career. His 84.1 all-time passer rating is lower than the figure Brock Osweiler put up for the Dolphins in 2018. Patrick Mahomes and Russell Wilson each posted touchdown rates of 8.2 percent or higher last season; Flacco’s season high since 2015 is 3.4 percent. Still, he’s only 34 years old in a league where QBs are playing longer than ever, and he’s shown he’s capable of putting together his best performances in his team’s biggest games. He’s got a 17:2 touchdown-to-interception ratio over his last six playoff starts, though he hasn’t seen the postseason since 2014. He remains moderately turnover averse as well; only 1.6 percent of his passes last fall ended in interceptions, a lower rate than Tom Brady, Jared Goff, Patrick Mahomes, or Andrew Luck. What he is for the Broncos is another short-term fix, though. The team signed Case Keenum during the 2018 offseason to underwhelming results and general manager John Elway spoke of the team’s need for a younger player to build around. Flacco isn’t that, but he could provide a bridge for whatever young quarterback ends up in Denver. Early in Elway’s career as an executive, he convinced Peyton Manning that Denver was the perfect place to finish up his career. It ended up being a great move for both parties and the Broncos played in two Super Bowls over Manning’s four seasons with the team. That’s the only good quarterback luck that Elway has had, though. Since he took over as general manager, the team has drafted Brock Osweiler with a 2012 second-round pick, Paxton Lynch with a 2016 first-round pick, and Zac Dysert, Trevor Siemian, and Chad Kelly with seventh-round picks. None have worked out at all. A year ago, he signed Case Keenum to a two-year, $36 million deal after the veteran led the Vikings to a 13-3 record and a trip to the NFC Championship. But Keenum turned back into a pumpkin with 18 touchdowns and 15 interceptions during the Broncos’ 6-10 year. Now, the team is likely set to part ways with Keenum and eat $10 million in dead money to jettison their prized acquisition from a year ago. All of that inspires little confidence that Elway knows what he’s doing with a trade for Flacco. It also doesn’t give much reason to believe he’s going to find that long-term solution at quarterback that will presumably learn and grow behind Flacco. Ultimately, Flacco is a low risk, low reward pickup who could be a useful plug-and-play option in a ready made team. He’s proven he can guide a team with a dominant defense to a Lombardi Trophy, even if that was more than half a decade ago. That’s a formula the Broncos can try to follow with Vic Fangio now leading the way. Is he any better than Keenum was in 2018, though? If not, it’s a mistake that only wastes money and a fourth-round pick. Flacco won’t lose a team many games single-handedly at this point in his career — but he probably won’t win many, either.